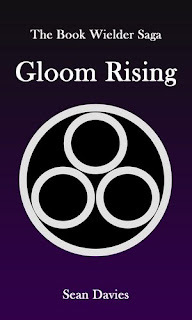 A different take on the supernatural, 'The Book Wielder Saga: Gloom Rising', is filled with action, excess, magic and mayhem. Winston Reynolds' mind-numbingly normal life gets turned upside-down when he stumbles across a mystical old tome that bestows upon him magical powers, alchemical knowledge and the ability to enter the Gloom; a dark reflection of reality filled with arcane possibilities and dangers. After learning that he is a Book Wielder, a small group of individuals chosen an unknown force to wield the strange tomes, he is exposed to an alliance of Supernatural creatures consisting of Vampires, Werewolves and Mages hidden within his own world. These Supernaturals depended on the Book Wielder's ability to cross into the Gloom, because it was only there that the key ingredients to their potions could be found, and not to mention the drugs they peddled to the humans. After the shocking news sinks in he quickly sets himself up in the Shadow Circle, the most powerful Supernatural crime gang on his continent, to escape his unbearably mediocre life. But an interview for a more prestigious position within the gang changes Winston's life in more ways than he could have ever imagined. For it wasn't just fate that had taken a special interest in him.